Enforcing security in a network always comes with a tradeoff regarding budget constraints, entailing unavoidable choices for the deployment of security equipment over the network. Therefore, finding the optimal distribution of security resources to protect the network is necessary. In this paper, we focus on Intrusion Detection Systems (IDSs), which are among the main components used to secure networks. However, configuring and deploying IDSs efficiently to optimize attack detection and mitigation remain a challenging task. In particular, in networks providing critical services, optimal IDS deployment depends on the type of interdependencies that exists between vulnerable network equipment. In this paper, we present a game theoretical analysis for optimizing intrusion detection in such networks. 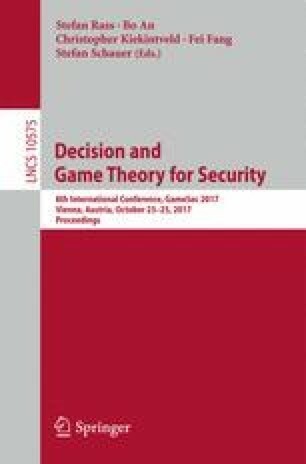 First, we present a set of theoretical preliminary results for resource constrained network security games. Then, we formulate the problem of intrusion detection as a resource constrained network security game where interdependencies between equipment vulnerabilities are taken into account. Finally, we validate our model numerically via a real world case study. This research was initially supported by the MSSTB project, in collaboration with Airbus Defence & Space CyberSecurity and Cogisys, through the Program Investissement d’Avenir funded by the French public financial organization Caisse des Dépôts et des Consignations, and later by the Cyber CNI Chair of Institut Mines-Télécom held by Télécom Bretagne and supported by Airbus Defence and Space, Amossys, BNP Paribas, EDF, Orange, La Poste, Nokia, Société Générale, and the Regional Council of Brittany, and acknowledged by the Center of Excellence in Cybersecurity.